The Latest technology is offered at these executive suites. Close to Regan International Airport via Rosslyn Lines. Offices are furnished to a high standard and offers spacious meeting rooms to accommodate up to 25 persons. Wireless internet available long with Starbucks coffee refreshments. The regional transport links are also excellent and offer all prospective tenants with easy access to the wider region at large. Office suites located near Route 1 and a short walk to DC and to Ronal Regan International Airport. Close to many shopping and eating amenities with easy transport access. Great deals are currently at this centre providing a range of business amenities. This center is one you will not want to leave. The amenities are one for the books. Between the conference rooms and large offices with natural light, you will be in awe. The best part is the fitness center, pool and sauna easily accessible from your office. Stop in and check out these amenities that you need to see to believe. There are restaurants and shops nearby and do not forget the unique nearby attraction, the Pentagon. 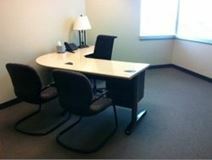 Corporate centre located less than 15 minutes’ to downtown DC and easy access to Capitol Hill. This centre has been refurbished recently and includes well designed office suites. Great reception and lobby area to welcome guests. High spec technology offered with audio/video enhancement. Easy parking available. This business center, opened in 2007, has furnished office space available with a fully stocked kitchen and rooftop access. The center is located close to Ballston Mall and many restaurants. The center can be easily accessed using public transport. These incredible and highly contemporary executive suites are both exquisitely furnished and ideally situated in the very heart of Ballston and provide modern, technologically innovative workspace solution packages to work from around the clock for all professional occupants. With a beautiful park just behind the main building and direct and convenient access to the whole city this is a great location with excellent transport links and great amenities included. Executive suites to let at this modern 13 storey building. Close to downtown DC, this location is easily accessible via rail, car, and the metro. The offices are based at the Fort Myer centre, offering great views from the balcony. This fantastic collaborative workspace, situated in one of Virginia's fastest growing innovation hubs, is great for those that do not wish to work in a conventional office. Covering two floors of the building, the center provides amenities such as private phone booths, comfy break-out areas and complimentary fruit infused water give everything possibly needed throughout the working day. With a beautiful lawn area, tenants can relax and enjoy the site whilst lunching or working this is the ultimate space to build and grow your business. This center is a beautiful center coming in the Winter of 2018! It has all of the amenities that one could wish for in creating a fun and positive work environment. Check out the break lounge after grabbing a craft coffee at the coffee bar. Take lunch at the on-site cafe on a busy work day. Utilize the conference rooms for collaborating with the team or relaxation rooms for a a calm and cool power hour of work . This center is located in the beautiful at the center of shopping, dining and transportation. It doesn't get much better than having everything right at your fingertips/ It is a quick walk to Ballston MU-Station making for a convenient commute for all tenants. The views are fantastic fro the building giving a great city vibes. You will not be disappointed with this prime time location. Located in the cultural and economic heart of the vibrant and commercially significant Clarendon neighborhood, this center combines cost-effectiveness and convenience with some of the most innovative and sophisticated workspace solution packages available anywhere in the area. Offering over 24,000 sq ft of office space, as well as three conference rooms, team rooms and much more. Some offices boast panoramic views. Offering a collaborative and empowering environment made up of shared, private and co-working office space and located in Rosslyn"s vibrant urban sector, the center is perfectly located with fast transport links connecting you to Washington D.C. The regional transport links are also excellent, with a wide variety of convenient and frequent services in operation throughout the area, making the center easily accessible for both tenants and professional visitors to the site.